Get ready, Dystopian book fans, because you've never read anything like this. 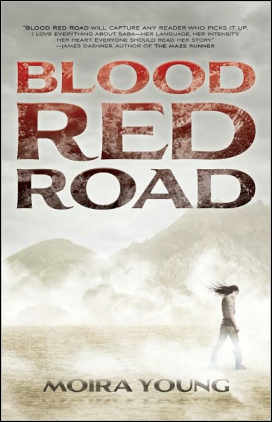 Blood Red Road by Moria Young is a fairly new novel that just hit store shelves on June 7th, 2011, so not too many people know about this amazing read yet. But the thing is, they need to, because Blood Red Road will blow you all away, even if you aren't a Dystopian fan. Saba has lived in the dried up, savaged desert land Silverlake her entire life with her Pa, twin brother Lugh, and little sister Emmi. And that's fine with her, just as long as she has her beloved twin brother there with her. The Wrecker civilization, which is us people in 2011, has long been destroyed. Blood Red Road is set sometime in the future, the date not specified. Their country/nation is ruled by a rogue king and his army of warriors, the Tonton. Saba doesn't know this, however. A huge sandstorm arrives in Silverlake, bringing four mysterious cloaked horsemen with it. Lugh is kidnaped by them and taken far, far away from Silverlake. Unsure why these mysterious men chose her brother to capture, Saba makes a promise to find and rescue Lugh. She is finally forced to embark upon the world outside Silverlake, and it's not exactly very welcoming. Corrupt futuristic societies surround her and she isn't sure where to turn. Then she meets Jack, a handsome daredevil, and a gang of girl revolutionaries called the Free Hawks who help her make the difficult journey. Blood Red Road is so different from every book I've ever read in my life. Why exactly? Well, for starters, there are no quotation marks in this book at all. I know what you're thinking, "How is this possible? You need quotation marks for dialogue!" It is a little confusing at first, but after a while you begin to get used to the style. Another unique thing about Blood Red Road is the language/voice of Saba. I can't even quite describe it, so I'll show you. "Because everythin's set. It's all fixed. The lives of everybody who's ever bin born. The lives of everybody still waitin to be born. It was all set in the stars the moment the world began. The time of yer birthin, the time of yer death. Even what kind of person yer gonna be, good or bad. If you know how to read the stars, you can read the story of people's lives. The story of yer own life. What's gone, what's now an what's still to come. Because you cain't change what's written." As you can tell, it is really different from our normal language. That and the lack of quotation marks set the tone for this novel so well. It helps the reader see the type of people they are and how they live. You may have read other Dystopian novels like The Hunger Games by Suzanne Collins, but I assure you Blood Red Road is nothing like it. Critics compare this novel to The Hunger Games and say that readers of that series will fall in love with Blood Red Road. I beg to differ. Blood Red Road is an extraordinary experience that you can get nowhere else. Moria Young has created this world that no one would ever imagine, and it's so creative. It's filled with action, drama, suspense, friendship, and even romance! Moria Young adds just the right amount of romance; it's like the perfect topping on the cake! The characters are very realistic and likeable. I fell in love with Saba and Jack right away. You'll find yourself rooting for the characters as the story goes along. My only negatives about this novel are that the beginning is a little slow, and the dialogue and lack of quotation marks is confusing at first. Other than those small things, it's all positives for me. I highly recommend Blood Red Road to everyone; you'll succumb to its awesomeness right away! I rate Blood Red Road 5 out of 5 stars!